In JSON format often find search words becomes available. http://localhost:8080/ Fess /JSON? can be retrieved by accessing the type = hotsearchword. Delete the job days before the specified date. One day in the one log purge old log is deleted. Delete the user information for the specified number of days ago. One day in the one log purge old log is deleted. Specifies the email address to send information about crawl upon completion crawl. Crawl as been updated to enable incremental crawl compared lastModified field value and the target document’s modification date (if the HTTP’s timestamp if LAST_MODIFIED values, file). File additional group access rights information added to the role. You can automatically delete data after the data has been indexed. 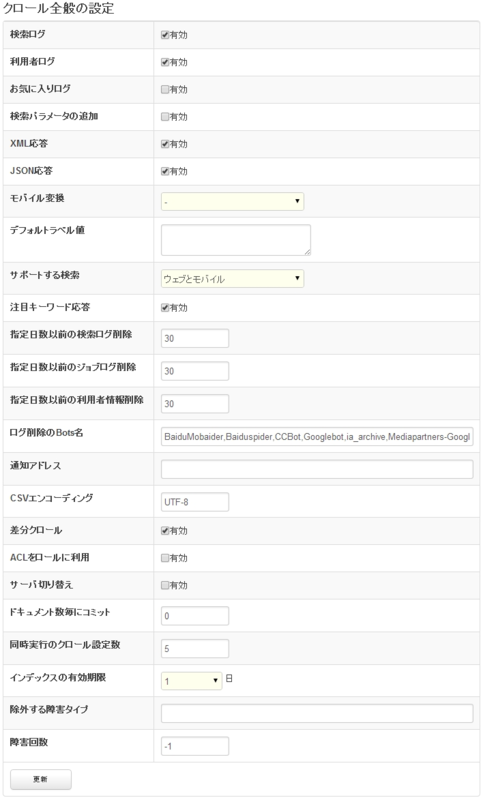 If you select the 5, with the expiration of index register at least 5 days before and had no update is removed. If you omit data content has been removed, can be used. Registered disabled URL URL exceeds the failure count next time you crawl to crawl out. Does not need to monitor the fault type is being crawled next time by specifying this value.